Kunde Family Winery is owned and operated by 4th generation winegrowers producing 100 percent estate-grown wines from Sonoma Valley. What they have for pups: Hiking through the vineyards with the dogs. 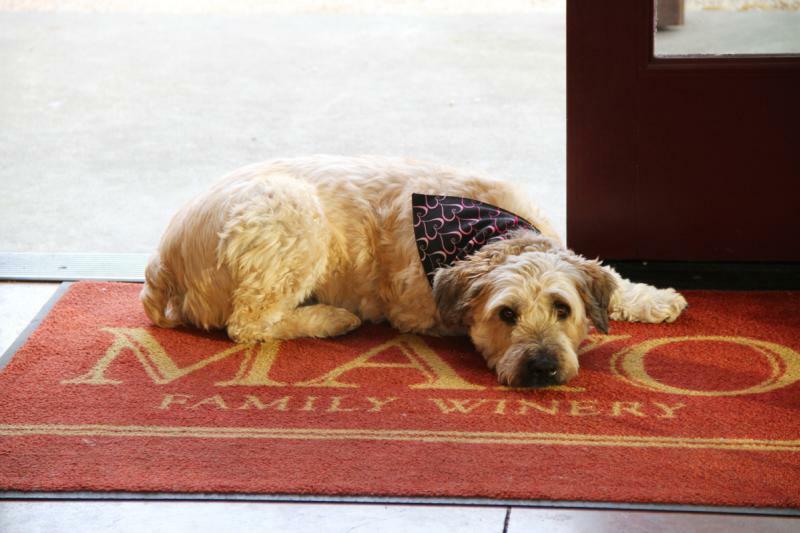 Fourth-Generation Winegrower Jeff Kunde and his Dogs Cooper and Marley cordially invite guests and their furry friends for a hike through the breathtaking Kunde Family Winery vineyards. Where else do dogs get such royal treatment? A hike along the Sonoma Valley floor — winding through oak woodlands, native grasslands and chaparral—trumps the dog park any day. Something special for People: Mountain top wine tasting. Take wine tasting to a whole new level with this one-of-a-kind experience, set 1,400 feet above the valley floor, surrounded by the stunning natural beauty of our 1,850 acre estate. Begin your journey with a private guided tour of our half mile of wine aging caves. You’ll then embark in one of our private coaches as you wind your way through the estate vineyards to our Mountain Top destination including a chance to stop and stand next to vines planted in 1882! Wine to try: Three Lab Cabernet Sauvignon (appropriately named after our three winery dogs!) Our wonderful labs, Buster, Bubba, and Pete are the inspiration for this rich full-bodied Cabernet Sauvignon, Petite Sirah, and Merlot. Something special for People: We invite you, your family and friends to experience world-class wines in a warm and inviting setting. Our friendly and knowledgeable staff is ready to take you through a tasting experience that you won&apos;t find anywhere else. Our small lot, estate wines are sold exclusively through our tasting room and wine clubs. Our barn turned tasting room is filled with memorabilia and artwork that tell the story of the families five generations farming the 101 acre ranch. The spacious back pad has many redwood tables where you can bring your own picnic, as well as bocce court, large lawn with fun games and the best view in Carneros. Since 1858, the Bundschu family has enjoyed the beauty of Rhinefarm and the exquisite character of its wines. We invite you to spend a few hours getting to know the land, the wines, and the people that make Gundlach Bundschu unique. Just five minutes from the historic Sonoma Plaza, our location at the foot of the Mayacamas Mountains along the Napa-Sonoma border is convenient for visitors to either acclaimed region. Something special for People: Join a guided tour of the Rhinefarm property that has been farmed consecutively by the Bundschu Family for six generations. Learn about what makes our vineyards so special and about our sustainable farming and winemaking practices that allow us to make the highest quality, estate-produced wines. Each tour concludes with a tasting flight of five Gun Bun wines. We are a small family owned winery located in the heart of the Sonoma Valley. We believe that single vineyard wines make for the most interesting and satisfying drinking! Since the early 1990&apos;s we&apos;ve constantly looked for those vineyards that provide a great match between terroir and varietal. The result is an array of small batch, single-vineyard wines that meet our criteria. Something special for People: Tours and tastings, check out the crushpad, the barrel room and the patio area, all of which are pet friendly! Try delicious sparkling wines, or one of our 25+ varietals available. Benziger, a family-owned winery in Glen Ellen, focuses on family, great wine and healthy vineyards. Wine to try: Paradisio De Maria Sauvignon Blanc, and of course our estate Tribute red blend. Something special for People: Take a biodynamic tour around our estate vineyards, insectary, wine caves and wine making facility before venturing to our tasting room to try our delicious wines. 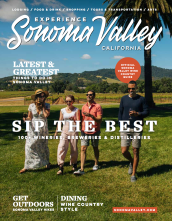 Just a few blocks east of the historic Sonoma Plaza, Bartholomew Park Winery sits on a 400-acre preserve that includes a 3 mile hiking trail through wooded groves and vineyards. Hikers are exposed to a variety of native California trees including oak, redwood, manzanita, and madrone. Dogs are welcomed so long as they remain on leashes and owners pick up after them. What they have for pups: Pack a lunch and a Milkbone so that you and your companion can enjoy a replenishing picnic at “Bart Park” once returning from your journey through the preserve. Dogs are also welcome in the tasting room and museum. Something special for People: On a clear day trailwalkers can see all the way to San Francisco.